Flash! The US has re-invaded Iraq! The actual invasion has been a two-month-long stealth process, beginning in mid-July, when President and Commander in Chief Barack Obama ordered some 800 US troops sent to that country in response to the growing battlefield success of fighters with the Islamic State of Iraq and Syria (ISIS), a group initially trained and funded covertly by the US, which intended for ISIS to topple Syria's leader Bashar al Assad, only to have the group decide it wanted to attack Iraq and behead US journalists instead. This force of 800, which at the time was said to be "assessing and advising" Iraqi forces as the Iraqi military battled ISIS, was then enlarged by the addition of another 130 "advisors" who were sent to northern Iraq a month later on August 13, and finally by another influx of 20 Marines flown in to Mt. Sinigar and finally by 350 troops flown in yesterday under cover of darkness, allegedly to "protect" the US Embassy compound in Baghdad. That brings the total of US troops known to have invaded Iraq this summer to 1300, which slightly more than the 1000 troops that the US claims Russia has secretly slipped over the border into Ukraine to invade that embattled country of 54 million. So now we supposedly have two invading armies invading countries in western Eurasia -- Russia in eastern Ukraine and the US in Iraq -- though the US has been fighting much more aggressively with the use of attack drones and aerial bombardment as well as ground troops. In Ukraine, Russia's stealth army -- the one nobody has seen -- has somehow nonetheless managed to shatter the 50,000-strong Ukrainian army, causing Kiev's troops to leap into their tanks and armored vehicles and flee westward for their lives. In Iraq, the small US expeditionary force has managed to topple Iraq's dictatorial leader Nouri al-Maliki, installing a regime more to the US's liking. Experts say that these two stealth invasions signal a new development in the annals of warfare -- one in which astonishingly tiny armies are able, through the use of stealth invasions, deft tactics and secret weaponry, to defeat much larger traditional foes armed just with the usual small arms, larger artillery pieces and, in Ukraine's case, tanks. The advantage of this development for the aggressor nation is that its leader -- President Vladimir Putin in Russia and President Barack Obama in the US -- is able to plausibly deny that any invasion has occurred. Putin, for his part, can continue to insist that his 20,000-strong potential invasion force is simply cooling its heels on the Russian side of the border with Ukraine, even as his stealth army of 1000 is smashing Ukraine's military and sending it scurrying for the relative safety of the western part of the country. Obama, meanwhile, can credibly claim that he is just sending in advisors and embassy security guards, even as his stealth invasion force of 1300 is turning the tide of battle decisively against ISIS, and simultaneously bringing regime change to Baghdad, thus weakening Iran's influence on Iraq. Where it will get interesting is when the stealth armies of the US and Russia end up on opposite sides, shooting at each other. This could happen soon. In Ukraine, the US has announced it is planning late in September to slip some troops into western Ukraine for "joint training exercises" with other NATO troops and members of the Ukrainian military. 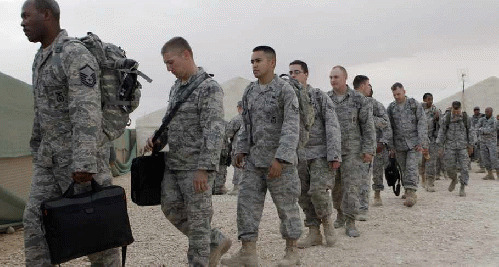 It would be an easy matter, once in country, for this mini-army of US troops to head stealthily eastward and confront the stealth mini-army from Russia. Likewise, as the US appears to gear up for a mini-invasion of Syria, which will be presented initially as an attack on ISIS on its home turf, but will predictably turn into an assault on the Assad regime, it is likely that Assad's leading backer, Russia, will send in its own stealth mini-Army to protect its client. With stealth armies from the two rivals facing each other in both Ukraine and Syria, it will be exciting to watch and see who comes out on top. Whoever wins these coming mini-battles of stealth armies, war will never be the same.